I've always been a supporter for utilities built for iOS, once I even said we can't have a "rich environment of interactions without such apps". Blink is the newest addition to this collection and a great one if you're constantly fiddling with App Store links. The idea is that you can search for apps, as you would in the App Store, and Blink returns a link to the app you pick. The output may be either a Markdown (in 3 different formats available) or plain text, yet Blink stands out by allowing you to append parameters to this link, such as your affiliate token or campaign code. When you join the iTunes Affiliate Program you get an affiliate token and for every iTunes or App Store product purchased with your token, you earn a tiny chunk of the sale — around 7%. Every link to the App Store in this site contains my affiliate token, it is one of the many ways I generate revenue. You can create these links with the iTunes Link Maker and that's so unpractical on iOS I built a custom UI for Editorial to do it. Blink lifts off all the friction in this workflow with a simple interface; which also shows the icons, something my Editorial workflow doesn't. I wrote a version of the workflow for Editorial using Blink and I couldn't be happier about it. You can download it here. This action requires your Markdown format to be (Media Title)[Link] and you can modify it on the in-app settings. If you prefer to create links on the go with Drafts, the following action looks for the selection and creates a new draft with the markdown link. If you just want to get a link for an app to tweet about, you can use this Launch Center Pro action. 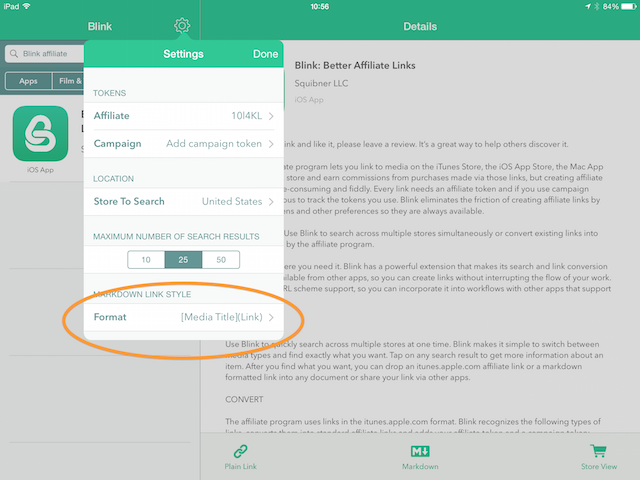 You can also use an iTunes link as a search query, Blink will get the right app for you and replace any affiliate token with yours. Best of all? You can do that from its sharing extension, just trigger it on an iTunes Link and it swaps everything for you. Lucky for me, you can't do that from Safari, however, if you read articles on Unread or any other app with an internal UI for the App Store1, you can keep all the affiliate revenue to yourself — I shouldn't be sharing this. Just remember that every time you do that on this blog, a puppy dies. Add your affiliate token everywhere — except this blog. If you write about apps or just share them often, Blink can definitely save you a couple of taps. I hope they improve the URL scheme in upcoming updates so we can define the type of link in the url action instead of being prompted every time we return to another app. Notwithstanding, the first version is a breeze and found a soft spot in my writing routine.